Elizabeth is a writer, educator, and dynamic speaker with extensive experience in citizen diplomacy, women’s empowerment, environmental health, and issues of international justice and peace. Elizabeth began her activist work with Dr. Martin Luther King in Selma, Alabama in 1965. She went on to coordinate the White House Conference on Children and Youth in the early ‘70’s, worked with the newly formed National Public Radio, and then for seven years served as a consultant to John D. Rockefeller 3rd on projects related to women, population and development. She received her doctorate from Harvard University in 1982, while at the same time founding her own company to improve the quality of television programming for children. In the 1980’s and 1990’s she studied with both Fr. Thomas Berry and Joanna Macy and became an educator in the fields of deep ecology and ecopsychology. In 1994 she took this spiritually-based approach to environmental awareness and education to Southeast Asia, training Buddhist monks, nuns and tribal elders. In 1999 she and her husband, Elias, sold their home and began an open-ended international pilgrimage of service and teaching. For six years she traveled where she was called — teaching, leading interfaith retreats and solidarity walks, bearing witness to injustice and conflict, and testifying to what she experienced. After 9/11 this work took her and her husband increasingly to the Muslim world. 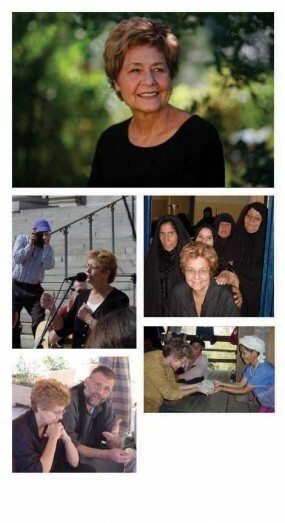 She brought international attention to the plight of civilians in Iraq prior to the U.S. bombing. Subsequently she engaged in citizen diplomacy and peace building work in Syria, Jordan, Palestine/Israel, Iran, and most recently Afghanistan. Elizabeth is co-editor of the books Earth Prayers, Life Prayers, and Prayers for a Thousand Years. She is a Murshida (teacher) in the Sufi tradition, and a long time student and teacher in the Buddhist tradition. • Invite Elizabeth to speak at your event. • Work with her on Afghan projects. a non-profit 501(c)3 organization. 1644 Pearl Street, Boulder, Colorado 80302 USA.